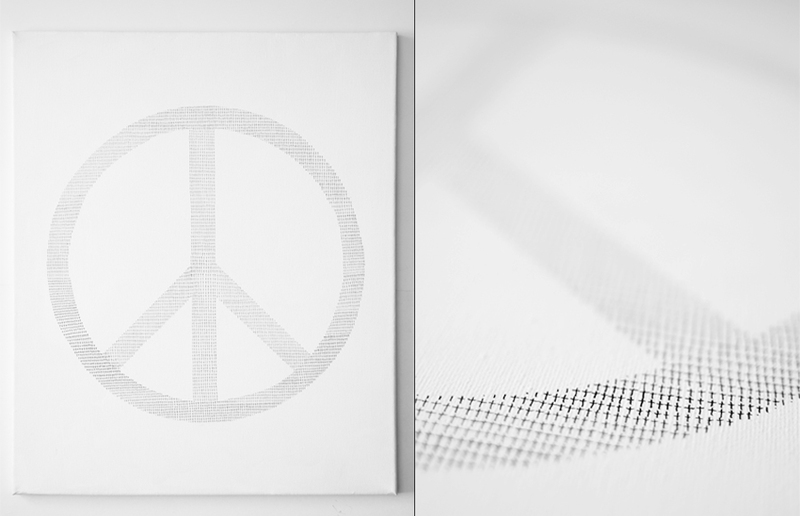 When you look at the painting from a distanced point of view, you are easily decoding the “peace” symbol, used by hippies during the Vietnam war. This symbol is powerful, everyone know its meaning, everyone can recognize its shape; he is popular and has been spread all over the world since the sixties. When you see it at first, your thoughts are focused on peace, on the hippie movement or anything related to this movement and the knowledge you have about it, like flowers, long beards and haircuts, small communities, love, Woodstock, guitar and so on, and so forth. Only a glance at this symbol suffice to generate happy thoughts in your mind, to fulfill the moment with joy and good feelings. But after a few seconds you notice that something is not right. From the distance you see that the symbol has a strange feature, it seems light, filled with air, unstructured, almost superficial, like if it could disappear in a second. When you come closer, as you would do with any other painting, you see that the main symbol is filled with a thousand of christian crosses, a tragic symbol of death. Like if it was a peace-symbol-shaped graveyard. The happy thoughts are now slowly vanishing into the void and you might be confused, wondering which symbol is above the other. My point here, is that in our occidental world, we are usually taking everything we have for granted. As citizens born in freedom, liberty and equal right, we tend to forgot that a lot of people died, fighting for their rights and believes and therefore ours. Strong symbols are a condensed version of history, they reminds us past events, may they be tough or soft. So we don’t forget that behind peace and liberty hides ancient war and struggles.